Giddy up Cowboys and Cowgirls! Hereâ€™s a game celebratinâ€™ the rodeo! 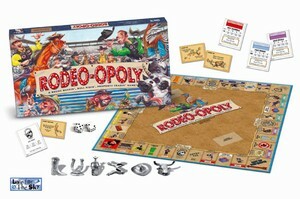 Whether you enjoy rodeo from the back of a bull, the saddle of a bronc, or viewed on the wide screen in the comfort of your easy chair, youâ€™ll have a whole mess aâ€™ fun playinâ€™ Rodeo-opoly with family and friends! Full of rodeo humor and rodeo facts, Rodeo-opoly is a big â€œHats Offâ€� to this fascinatinâ€™ sport and way of life. Buy favorite rodeo properties. Increase rent on your properties by collecting Scores and trading them in for Gold Buckles. Itâ€™s all fun and games until youâ€™re sent to Bucked Off, then youâ€™re skiddinâ€™ on your back side across the board and youâ€™re out for three turns!